If you love the look of flickering candles amidst holiday greenery but are concerned about the safety issues, decorating with faux holiday greens and flameless candles is a beautiful and safe alternative. Enjoy the beauty and ambiance of candlelight without the danger of an open flame. Flameless candles have the look and aroma of real candles without the worry. Made from real wax, flameless candles are battery powered. An LED light bulb, which acts as the flame, glows and flickers just like a real candle. The beautiful assortment of faux greenery that is available for the holidays is breathtaking and extremely authentic looking. From simple pine needle boughs and holly berry wreaths to lush evergreen centerpieces and amaryllis garlands, faux greenery will add a touch of elegance to your holiday decor. 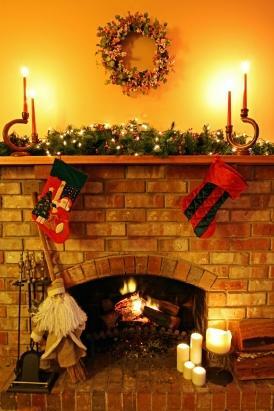 The following are several ideas for decorating with faux holiday greens and flameless candles. Place festive amaryllis garland on your mantle. Add two tall flameless pillar candles in hurricanes on each end for a dramatic effect. Place an assortment of flameless tapered candles into beautiful candle holders of different heights on the mantle. Add a simple green garland for an elegant look. Create a beautiful holiday table runner of lush faux greenery. Add several flameless candles and holiday ornaments or pine cones to turn your table into an exquisite focal point. Create a round centerpiece of greenery and pine cones. Add a beautiful holiday flameless pillar or taper candle in the center. Placing holiday window candles in your windows creates a warm inviting look. Arrange a bouquet of mixed greenery using sprigs of holly and evergreen into a favorite holiday vase and place it on a round mirror on the center of your table. Surround the vase with flameless votive or tea light candles in clear candle holders for a shimmering centerpiece. Add texture and depth to your faux greenery by layering different kinds together on a tray, table or mantle. Place flameless candles around your potted plants, or holiday poinsettias. Place faux pine boughs, a bowl of shiny holiday ornaments and large flameless candles on your mantel for a simple but elegant holiday style. The following are a sampling of the many websites that offer faux holiday greenery and flameless candles. Decorating with faux holiday greens and flameless candles is a safe and beautiful way to decorate your home for the holidays.